Yearly, 700 active duty military members receive Permanent Change of Station Orders. Reassignment frequently occurs, on average every two to four years. Sudden relocation causes stress and anxiety, uprooting yourself, and potentially your entire family is an ordeal for many. Aside from the emotional burden of the move is the financial implications of a PCS. The median expense incurred during a PCS among military personel is $1,700 in non-refundable money. Although a PCS is often categorized by the difficulties surrounding it, there are ways to not only reduce the stress of the move, but the monetary damage as well. When it comes to setting up your move, planning ahead can save you much stress. If you are interested in buying a house in your new location, the VA loan approval process will be encompassed in the preparation for your move. More families consider summer the ideal, least disruptive time to move. In fact, over 225,000 Coast Guard and DOD household moves (shipments) occur during the summer months alone. During the summer months over half of all DOD and military moves occur. The height of the summer moving season happens as both military and private sector civilian families attempt to take advantage of the long holiday weekends that Memorial and Independence Day provide. Because of the extra time off, the busiest part of the peak moving season begins at the end of June and continues into the weekend after the Fourth of July. According to DOD officials, the bulk of residential moves happens during the summer break. As military household shipments compete with civilian household shipments, a backlog is created for both officials and movers / carriers. Service members who attempt to move around these dates may run into some obstacles in trying to guarantee specific dates. These roadblocks, however, can be mitigated by booking moving dates early. This alone is key in avoiding the rush. According to John Johnson branch chief of the personal property directorate quality assurance division of the Army’s Military Surface Deployment and Distribution Command, “careful planning is vital to ensuring a smooth move, especially during the busiest season.” The directorate manages the personal property program for the Defense Department. If you are scheduled for a move as a result of a PCS , military retirement, or civilian DOD transfer, these tips from the VA Home Loan Centers and DOD can help make the process a little less stressful. Book your move as early as you can. Try to remain as flexible with your dates as you can. If you are unable to obtain the dates you want, consider a do-it-yourself move (also known as a personally procured move). Among the advantages with a personally procured move is that the risk of shipment loss is lessened as well as the flexibility to move when it is most convenient to you. If you are employed by the DOD or are active duty, you can usually be reimbursed for the cost of a personally procured move. Use the DOD weight estimator to determine the weight of your items. Be sure to stay within the guidelines of the weight allowance for your rank or civilian pay grade. Minimize any excess weight to avoid overweight penalties. A great way to do this is to donate any unwanted goods and items to charity. AMVETS, Salvation Army, and Goodwill will not only pick up the items so you don’t have to move them, they can give you a tax deduction for your donation. Create a “moving calendar” and include important phone numbers and packing milestones. Plan the packing of each room by date. Rooms that are the least used (guest bedrooms and guest bathrooms for example) should be packed first. Track your moving calendar progression. If you find yourself behind schedule, adjust the schedule to get back on the timeline. Try to limit each box at a maximum weight of 35 pounds. Boxes that are less heavy are less likely to shift during the move and can prevent injury. A bathroom scale is a convenient way to keep track of the weight of each box. Take a picture of your stereo and computer cables and speaker wiring. An added precautionary step is to “label the cable.” If at all possible, print a copy of the wiring picture and place it in the box with a stereo or computer. Double box your fragile items. Pack the fragile items in a box with packing filler. Place the packed boxes in a larger box and surround those boxes with additional filler. Visit your local personal property shipping office, installation transportation office, or the DPS (Defense Personal Property System) before you begin the moving plan. 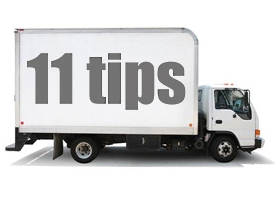 These are invaluable resources that can help provide further tips and assistance with your move. Once your move is complete, be sure to fill out a scorecard. DOD carriers and moving companies are awarded future business based largely on the results of their survey scores. An orderly move can be a stress-less move. These tips can help avoid a lot of the headaches caused by inadequate planning.